They had Asteroyds, Cuba expansion El Presidente, Essential Things, Storage Wars and a Temple Run game. The Works at Crystal peaks had much the same (as you would expect) no sign off Asteroyds or Priests of Ra though. They had a game called Havana which looked interesting, I picked up Mousquetaires du Roy. From THE MOOR Works this morning I got PRIESTS OF RA, PALAZZO and BONNY & CLYDE.... 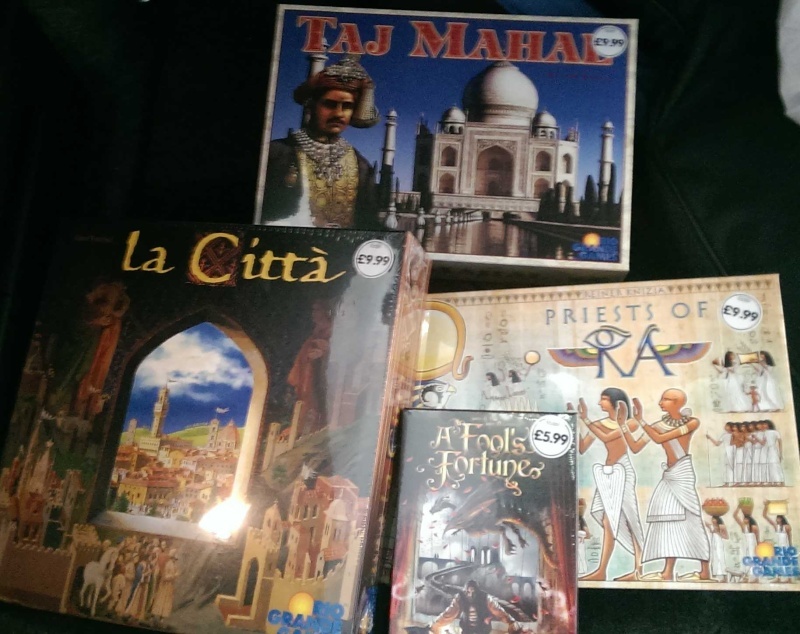 They had a load of others - but they'd sold out of TAJ MAHAL already - which I was interested in (Its about 150 in the top games on Boardgamegeek) - The lady in the shop said she didn't think they were getting any more of this batch of games in now.... If anyone picks up an extra copy of TAJ MAHAL from Meadowhell or Crystal Peaks - I'll have it!! I'm out of town this weekend, but if they have any on Monday I'll pick you one up, Evan. I did the same Evan... I'll check meadowhell on Sunday. Did you see the link about the boards? Aneurin wrote: I did the same Evan... I'll check meadowhell on Sunday. Did you see the link about the boards? That's great! - Yes - shall I pick up some more boards this Tuesday.... or should I wait until we've decided on the venue situation....?? Sorry, no sign of Vasco da Gama at Peaks, Paul. Oops! - I already said I'd have the copy Aneurin got for me.... Sorry Paul - I'll take the other copy too if no-one else wants it - I'm sure I can sell it on....?? Managed to pick up Warriors & Traders and Mousquetaires du Roy from Rotherham, they also had a few copies of La Citta left which is a brilliant city building game. RikTheChief wrote: Managed to pick up Warriors & Traders and Mousquetaires du Roy from Rotherham, they also had a few copies of La Citta left which is a brilliant city building game. I bought Mousquetaires du Roy a while back. It looks quite good, unlike every other hand I've bought on a whim. Ever. It's terrible. I'm ready for binning it.